2017 saw Howlers bound for Easter Venture heald at Caroona Creek Conservation Park near Mount Bryan East. We had programed 2 activities themed arund getting shipwrecked, washing up on a island and having to survive. The first activity saw venturers fighting for thier right to stay on the island by defeating another venturer team at volleyball. For the seccond activity, after surviving volleyball, some venturers got "injered" and whith these disabilities they had to erect a tent so that they could continue to survive until they where rescued. The weekend was great for rovers too, getting to go out and do some 4x4, changing tyres when they went flat, and genurally just having a good time. On the back of coming 2nd by one point in 2016, Howlers and Buffalo once again joined fources to show the city folk how rafting is ment to be done. As always we had to go bigger and better, so we did, succesfully creating a raft with 3 decks and a crows nest. Starting construction over 12 hours before the other crews, there was a plan and our illustrious leader had a plan, and it worked. Needless to say we were not the fastes raft, but we had an exki built in and where able to "eat up" another teams raft and when we were not competing our raft was definatly great fun to play around on, wether just sitting on the top to take in the views or jumping off the top into the river. At the end, after the fund and deconstruction we only were conserned about one thing, did we win? Well, kinda. Somehow Howlers/Buffalo, Aesir and the Commissioners all drew for first place. As per tradition, Howlers kicked off 2017 with our annual trip to Anglesea, Victoria for Surfmoot. This year our crew catered for and hosted most of the South Australian Rovers who attended. It was great! We visited various landmarks, went shopping, went to the beach and got a suggar rush at the chocolate factory. 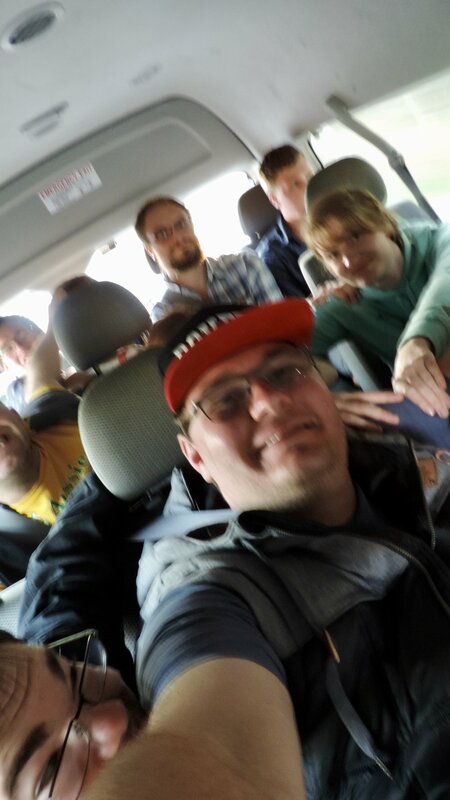 The weekend was topped off with some of us choosing to take the long way home via The Great Ocean Road. On the weekend members of Howlers Rovers took park in The Cancer Councils Relay for Life held at the Belair National Park. This year was the first time SA Rovers had entered a team and it definitely won't be the last. With only a week to go before the event the SA Rovers team was registered, leaving little time to fundraise but we managed to get 12 participants and raised $550 for the Cancer Council. The relay lasted for 19 hours. In that time we managed to do over 360 laps which works out to be over 72km! Our mascot Sam took out best costume and was very popular with the kids. Needless to say we had alot of fun, whether it was carrying a Rover around for a lap in a Kayak, having a small water fight or even just being at this amazing event. We will be back next year. For the third year in a row we ran our Moonlight Cinema event. This year we had to charge an entry fee for the event due to having to pay for things we didn't have to previously. Because of this Scouts SA gave us a hand and we got a major screen upgrade! This year we screened Zoolander 2 with the aid of Scouts SA's Screen. Needless to say this event just keeps getting better and better. As always, the night started off with some getting to know you games so that Venturers had a chance to talk to Rovers and find out exactly what it is that rovers do. Following that we cooked up some sausages on the BBQ and settled in to watch the movie on that nice big screen! Once again our bonfire was a huge hit and our new little picnic area got some raving reviews. We are looking forward to next years event and we hope that you are all eager to see what we have instore. Over the October long weekend SA Rover Scouts held their annual motorsport event, Sandblast. This year the committee decided to make 'Sandblast Regrassed' more diverse, with a change of scenery and a new Sandblast track on the river. Some of the new events enabled people who are not interested in racing to attend and have a great weekend away without all the dust of previous years. A change of venue from Walky Park to Wall Flat and a change from the onsite racing to an offsite expedition (reducing dust through campsites) were only but a few of the new changes in 2016. The Sandblast base camp is now situated on the riverfront at Wall Flat and has grass to make onsite activities more enticing. This location change enabled us to have a variety of new onsite activities. Saturday involved offsite expeditions, including a gourmet boat tour, hike through the scenic Mannum Waterfalls and of course racing! These expeditions were fantastic and everyone thoroughly enjoyed themselves. The weather after a storm is always rainbows and butterflies, which made for great cruising weather on the River Murray for the gourmet tour. The recent rains made for spectacular sightseeing at Manunum Waterfalls. Sunday saw a large number of onsite activities offered, which included volleyball, rafting, giant games and horizontal bungee. Due to the weather, water sports like kayaking, tubing and otherwise swimming in the river were cancelled due to high waters. An opportunity on Sunday arose with the option to visit the Man num Markets to buy some local goods and see what they had on offer. This gave everyone an opportunity to drop past the racing, which was held over the whole weekend, to see what Scout motorsport is all about. Over the whole weekend a camping competition dubbed 'Grandpa's Cup' was run. It was scored on your camp site's theme, a cooking competition and overall participation in the weekend's activities, which were not limited to a frozen T-shirt competition, sumo wrestling and a volleyball match. A lot of new faces were there on the weekend, as well as a lot of familiar faces. Even Victorian old boys (booted ex-Rovers) made the trip over to SA to show us what they could do. A huge thanks to some of our sponsors for helping us with prizes for the weekend. These included: Mannum Ice Works, DejaVu Mannum, Jester Cruises, Mannum Dock Museum and Visitor Information Centre, and Mannum Old Wares. All in all, it was a great weekend for Rovers and Venturers. We can't wait to see how we can make 2017 bigger and better. Did you know that Sandblast is open to Venturers as well as Rovers, so Venturers come up and race. 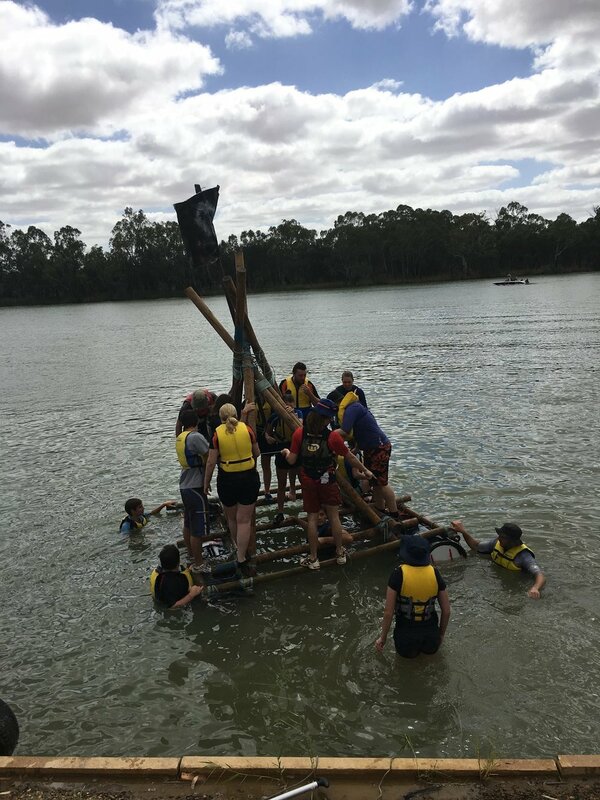 This year Howlers Rovers & Buffalo Rovers joined forces for the Roonka Raft Challenge. With hours of planning, building, tweaking and testing, out team came up with one beast of a raft! Coming in 2nd place (by only 1 point! ), and drawing with Commissioners, we were quite proud of our 26 points. Howlers had a blast joining in with the gigantic, overcrowded soccer match that was run during the second night, one of our members even provided some music and lights for the entertainment area. The commissioners brought up some Old Boys from their time in Rovers to try to show us how its all done, and despite all their talk they didn't come first! But they had tons of fun teaching and playing games with us that they treasure from their time as a Rover. All in all, Howlers made some fantastic memories this year up at the Roonka Raft Challenge, and we can’t wait to attend next year, and win! Over the weekend members of Howlers Rovers and Buffalo Rovers stayed up at a crew members shack at Mannum on the Murray River. 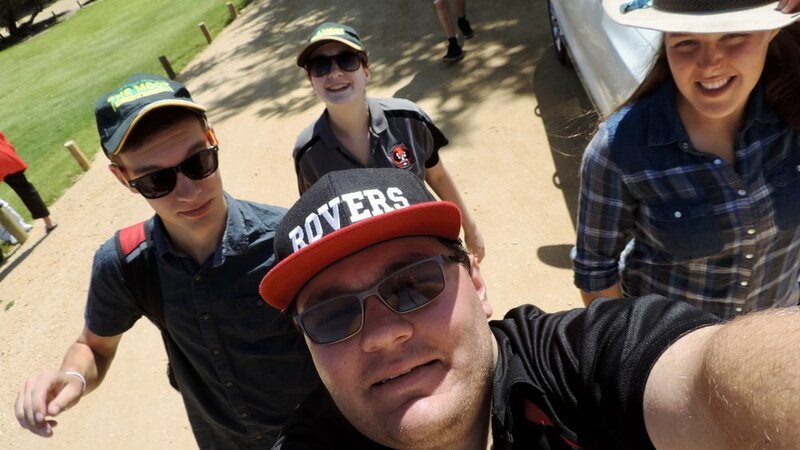 On Saturday we explored the town and cooled off in the river while listening to Sounds By The River then headed of to Murray Bridge Speedway for some fast cars and demolition derby! Sunday was more fun and games in the river, including going on a tube behind a 1 man power dingy! After the success of last year the Howlers Rover Crew decided to make our Moonlight Cinema event an annual occurrence. This year we opened up the event for all rovers in the state to attend. this was great because the Venturers were able to meet and interact with more Rovers than last year. Although the Venturer attendance was down on last year it was still a great night of playing games, sitting around the campfire and of course watching a movie. All in all it was a great night that everyone enjoyed and the picture for next years event has been painted bright. Our first major event for the New Year as a Crew was Surfmoot. This has become a Howlers tradition as every year on the Australia Day long weekend everyone piles into cars or a bus and sets off for Anglesea, Victoria. This year we had 11 current Howlers members and old boys go. The highlights included Nick, and his entry into the doughnut eating competition: Eating a doughnut, while doing a doughnut, around a doughnut; and then what happened after this. Another was the Crews’ introduction to cards against humanity which has resulted in a night being set a side just for Cards against humanity and board games. We also enjoyed a day at the beach, shopping in Torquay, watching jelly wrestling (even with it being censored this year), SA Contingent dinner on Sunday night and partying down at the stage each night. To sum up it was a good trip and with a bit of luck next years’ Surfmoot will be great.